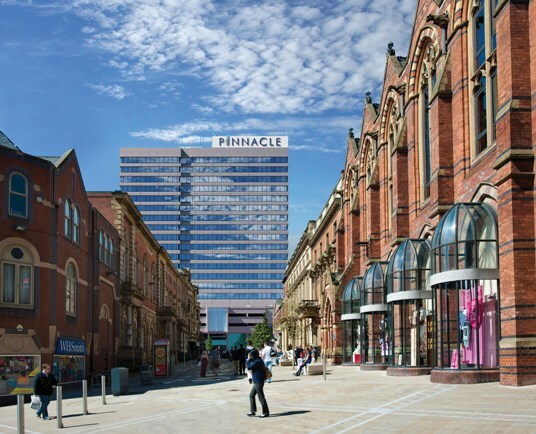 Brockton Capital fund has acquired The Pinnacle, a prominent 145,000 sq ft, mixed-use asset in Leeds city centre, for around £65m. The Pinnacle is a mixed-use retail, office and car park investment, situated in the prime retail core of Leeds, directly opposite the Land Securities-owned Trinity Leeds Shopping Centre, and bordering the city’s traditional office core. The asset comprises landmark office accommodation in Leeds’s tallest office block; 15 retail units all boasting prominent double-frontage along Bond Street and Albion Street; and a 388-space, multi-storey car park leased to Q-Park. The yield on this significant deal, the largest investment transaction in Leeds so far this year, is 6.5 per cent. James Spencer, vice president at Brockton Capital LLP, London-based investment adviser to the acquiring fund, said: “We are delighted to have agreed this exciting acquisition, which fits with our strategy of investing in significant and improving destinations in major regional cities. “Leeds has a vibrant culture; a young and growing population; and a thriving economy, and its retail and office sectors are prospering as a result. Eamon Fox, partner and head of Knight Frank’s office agency team in Leeds, said: “This is tremendous news for Leeds and we will work closely with Brockton Capital to create office space capable of accommodating additional jobs in The Pinnacle. CMS and Knight Frank advised Brockton Capital, DWF and Savills advised the seller, a private US equity firm, on the transaction.